Standing Start Triathlon (SST) is a Triathlon Queensland affiliated coaching service. SST is not a triathlon club. 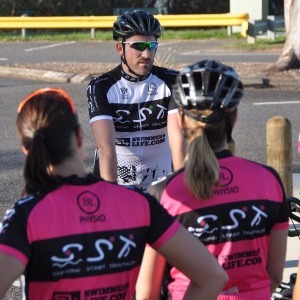 Whilst our “stable” of athletes may train together exclusively on weekend events for specific race preparations, SST is specialising in the provision of targeted training programs. Whether it’s for groups or designing tailored coaching services for individuals’ needs, SST helps people chase their personal goals, big or small! After successfully starting up South Bank Triathlon Club with two other friends, I found myself being drawn specifically towards Triathlon Coaching above everything else. I have a clear opinion that coaching is 90% about communication and 10% theory. We can all research an abundance of triathlon information online; it’s what we do with it that matters. My approach is to work with athletes to transform this information into knowledge. The application of this knowledge is what will be making you a better Triathlete. I aim to be your coach, your conscience and your confidant as you tackle your Triathlon goals. Triathlon continues to be one of the fastest growing participation sports in the country. It is a wonderful way to maintain a healthy lifestyle while meeting new people with similar interest. Our updated program is designed to cater for athletes of all backgrounds and abilities. This season starts off with a Super Saturday Seminar that takes place a week before the 6-weeks begins. This seminar will provide you with all the vital theoretical information to take full advantage of the 6-weeks. Whether you are a swimmer, a cyclist or a runner who is looking to put all three together (or new to all three! ), our course will equip you with all the skills, knowledge and opportunities to get a leg up into this addictive sport. Success. Coach Drew Standish has been notified of your message.